As we have been focusing on eating grain free meals to help with some health issues, I’ve had to learn how to shop for other foods besides grains that are filling, healthy, and easy on the budget! Since we aren’t using bread or rice as a ‘filler’ for meals, we’ve started using a lot more veggies. I think we all know that produce can really add up- I know I could easily spend hundred of dollars on fresh produce at the local farmer’s market or health food store every month if I didn’t watch what I was buying. But by choosing low cost fruits and vegetables, we can include more of these goodies in our diets. This can also causes us to try new recipes and become more creative in the kitchen. Carrots were the first vegetable that I started playing with. We can get organic ‘juicing carrots’ from Costco; 10 lbs for about $6.50! Juicing carrots are just fine for us, they’re not as pretty, but they are organic. I hadn’t ever done much with carrots besides eating them as carrot sticks or steaming them. I’m glad to have more uses for them now. Because I love fermenting vegetables, I tried pickling them, and they turned out great! The kids love Lacto-Fermented Dilly Carrot Sticks, and I love that they’re full of good probiotics! I also tried roasted carrot soup, something that is now an easy frugal family favorite! Bananas are another frugal year-round item in the produce section. Beyond slicing them over cereal or enjoying them plain, they can also be used to sweeten in place of sugar or honey and even made into pancakes! Banana Pancakes use lots of eggs, so they have more protein than the grain-based kind. Sweet ripe bananas are what we use to sweeten kefir smoothies. Ripe bananas can also be used in muffins such as these coconut flour banana nut muffins, nearly eliminating the need for any other sweetener! Not exactly in the produce section, but once lentils are sprouted they become more produce-like! Lentils are a good source of protein, carbohydrate, and fiber. They also are very inexpensive – $0.50 worth can make up the bulk of a meal for our family! Lentils, cooked, can be added to ground beef 1 part lentils to 2 or 3 parts beef, and used to extend the meat out further. Add lentils that have already been cooked to ground beef as you are browning it and they will take up some of the beef flavor. This can be used for chili, taco meat, and casseroles. 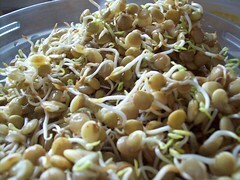 Sprouted lentils are a great addition to soups. Sprouted lentils can also be made into lentil patties– a healthy homemade veggie burger alternative. Winter squash recently went on sale here for $0.99/lb. This past summer when our garden overflowed, I dried some zucchini and other squash, and then I keep the now condensed squash in my freezer. Winter squash can be cooked, and served plain with butter, and a sprinkling of maple syrup and nuts if you’d like. Zucchini can be sliced and made into lasagna. We love Butternut Squash Soup with nourishing chicken stock and spicy ginger. These are four of my favorite frugal foods from the produce section. What are yours? Tough question! I don’t know that I can even choose. Kale is on the list right now, as most people in my area don’t seem to care for it, leaving huge bunches left at great prices. I use it raw, in soups, in smoothies, or sauteed with onions and garlic. Ooo, yeah, onions and garlic, definitely on the list. Kale! Although a bit on the more expensive side at times, I can often find it on sale for under $2 a bunch, which is enough for our family of 3! I saute it up or add it to soups. Or make kale chips. Or add it as the green in smoothies. It’s so nutrient rich, I like to just keep some on hand and add it to what ever I can! Do you have any tips for kale chips? I had tried them once and wasn’t impressed, but I thought we would like them. Lots of salt? I like them, but the rest of the family isn’t impressed either. I think they need a lot of salt. I use a lot of salt when sauteing kale as well. @Cara, try cooking them longer or less time? I tried them and then put them back in the oven a little longer and they were better then. Just don’t burn them! I LOVE them now. I love using potatoes. For dinner yesterday I just baked them and served with cheese, sour cream and bacon and corn on the side. My husband loved them and the most expensive part was the farm bacon, but I only used a bit of it. I like sweet potatoes. They go on sale here for 0.60 lb pretty often here so I stock up. My baby and I will eat them with just salt and pepper for lunch with a bit of cheese on the side. I like carrots and winter squash too. I really should use them more. I need more creative ways to serve them so my husband will like them. I know its not a produce and is sort of controversial for real food, but we eat a lot of whole wheat pasta. It is so cheap and easy. I made my own tomato sauce this summer and there are just so many ways to use it with pasta. And since my husband’s favorite food growing up was Kraft Mac N Cheese I have come up with a reasonable healthy homemade Macaroni and Cheese recipe he actually likes. So I am not ready to give up pasta yet 🙂 or pay $5 per lb for brown rice pasta. I am definitely going to try the lentils mixed with ground beef next month when I do my shopping. My husband loves tacos so hopefully that can save us some money there. Lori, I totally forgot about potatoes and sweet potatoes! Love ’em! Great thing is they store for a long time too. So you can stock up when on sale! Doesn’t work so well on other veggies! I appreciate these ideas. I’ve been wanting to get away from serving breads or grains at every single meal, but was kind of at a loss for things to replace them with. Thanks! In our area (SW Michigan/Chicagoland) we have found that beets are regurally 25-50 cents a pound, parsnips, rutabaggas, and turnips are 40 cents a pound, and carrots and celery can be 10#/$1! It is a favorite way to cook! Chop them and toss with oil then roast in the oven. Or my husband likes eating them as a veggies and dip plate. Some great ideas. I work hard to feed my husband and 3 growing boys a healthy but budget friendly diet. Some of our favorite grain free meals include baked sweet potatoes–we all love them with some cooked breakfast sausage crumbled on top. I also make sloppy joe meat and serve it with baked potatoes–very filling! 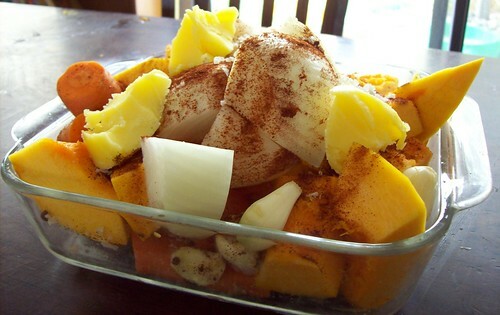 And our 3rd favorite is a butternut squash casserole–I mix cubed butternut squash and sliced apples. I top it with a cooked breakfast sausage and bake until the squash is tender. Whenever I’m in the grocery and see a new vegetable on sale for cheap, I buy enough for 2-3 meals and then figure out how to prepare it. We’ve discovered a few new vegetables this way. WOW that is a great deal on carrots!!! I would say around here that I buy things in season and therefore on sale. But it does add up fast. Probably squash (I buy it on sale in the fall and store some and cook and freeze puree). ALso pumpkin, and potatoes (I get at the farmer’s market in big bags and then they are grown naturally yet cheaper and then I store them). I;m going to have to try some sprouted lentil patties! Great post that I will bookmark! I love the idea of getting the big bag of carrots from Costco. I’ve gotten them before and not known what to do with them. Thanks for the new ideas! Great ideas! I would love to see more posts with grain free meal ideas. If it’s okay with Stephanie, I think that’s what I’ll do for most of my guest posts here! My favorite frugal veggies are the cruciferous family (green cabbage, red cabbage, bok choy, nappa, mustard and collard greens). They are great for stir fries and all my ferments! I like to fry up a small amount of ground beef, add in some chopped onions, garlic and mushrooms. Once it’s done I add at least half a head of cabbage, stir well, put on low heat and let it wilt, season to taste and it makes a great meal out family loves. Which reminds me sauteed onions are a great way to spice up salads, soups and beans. They really make a difference to me.